Today, we are first going to Shu’fat refugee camp. Then Daoud has organised a sightseeing tour by bus (good idea!) 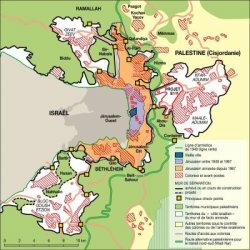 so that we can better understand what the Israeli government is planning to do with Jerusalem in the coming years. In spite of the thousands things he is in charge of, he has managed to free himself so he can spend these two days in Jerusalem with us – he will catch up with his work during the night and after we have left. We get off the mini-bus in one of the narrow streets of Shu’fat. We have an appointment with Adil, a 30-year-old Palestinian who works as a dentist in the free Health Centre of the camp. To get to the centre, we have to walk up a back-alley, or rather follow a torrent, single file. The sky is emptying itself on our heads and water is pouring down the slope without finding a way to get into the soil. There are no gutters, no sewers: the inhabitants have piled up sand sacks against their front doors… We jump from one stone to the next one and finally reach our destination… with not too wet feet. The contrast with the “houses” of the camp is striking: the Health Centre looks new: clear tiles on the floor, fresh ceiling boarding, all this at the costs of the UNRWA. We react: isn’t this looking on the black side of things only? As an answer to this, Adil tells us that, as far as he is concerned, he had to take a lawyer and spent all his money before at last, after three years, he managed to get his identity card back and was allowed to go to East-Jerusalem again without risking prison. “The fact is that we, Palestinians, have to prove all the time that we can be here”, Adi concludes. Yes, boycott helps without any doubt the Palestinian cause, even if it doesn’t help the families. The people here are ready to sacrifice their life to the cause. Before all the changes that are now taking place in the Arab World, the Palestinians had great expectations as to what Europe could do to help them, or more precisely to what its citizens could do, because they know that on the part of their governments there is only cowardice and hypocrisy. Yes, the parents in the camp pass on religious principles, rules and a morale to their children and if, in terms of social life, there may be a certain proximity with the Hamas (the importance of education, of respectability…), politically, the people feel closer to the ideals defended by the Fatah. It is in fact not uncommon to have different opinions in the midst of one family and all this mixes up gently. 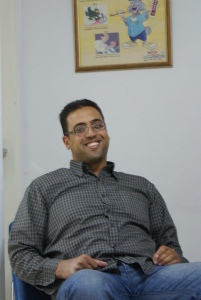 Adil believes in Isratine, which is a word Gaddhafi invented: one unique country for everybody. In his mind, the Israelis know that the future doesn’t belong to them. As for the present changes taking place in the Arab countries, Adil says it seems that power is in the people’s hands now. What few people know, he tells us, is that Israel planned to launch a new attack on the Gaza Strip. The Egyptian revolt put a stop to this plan at once... We didn’t know. 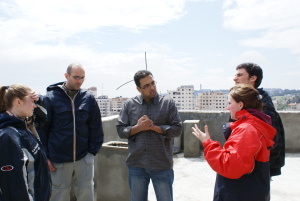 Adil suggests we went now onto the roof of the Health Centre. From there we can have a global view on all the camp. There, he shows us how indeed Shu’fat is surrounded by Israeli settlements: Pisgat Ze’ev and French Hill. 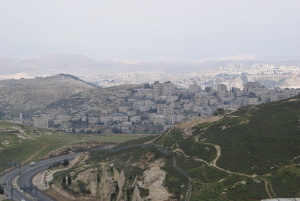 Then, to the east, there is an Israeli-controlled road, a military base, and the municipal boundaries of the enormous settlement of Ma’ale Adumim. 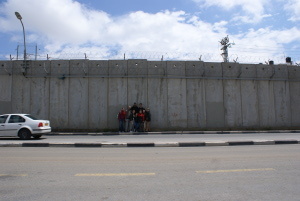 Adil reminds us that all of them are illegal, just like the concrete wall winding in front of us. 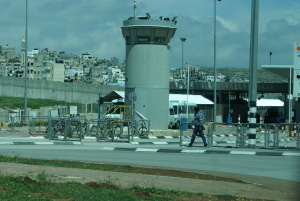 “The existing checkpoint is already bad enough: it is frequently closed arbitrarily and the site of incidents of harassment (see the reports of the Association for Civil Rights in Israel): people are made to wait for hours, their documents are confiscated for no reason, they are verbally abused. But that is not it all: there are regular incursions in the camp, raids carried out by hundreds of police officers and border forces. Palestinians are arrested for not paying their taxes or kids for throwing stones. These kids are arrested without the parents knowing what for, nor how long for. The families have to pay fines for their release and not everybody can afford it." We try to fit all this information in the lanscape that is lying at our feet: the winding wall-snake, the basic houses, the water-tanks on the roofs, the Girls’ school, the Boys’ school financed by Japanese donors... It is time for us to leave now, and for Adil to go on with his surgery hours. We thank him warmly for everything and walk down the little alley, which is now almost dry, back to our mini-bus. 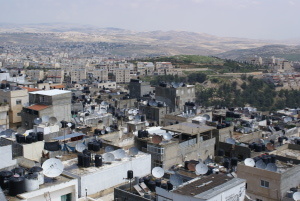 Daoud is taking us on a sight-seeing tour of the settlements situated on the eastern side of Jerusalem. As we reach the checkpoint that marks the entrance of the refugee camp, Margot, who has researched a lot before the trip, tells us that a third of the taxes paid by the Palestinians goes directly to the military sector, i.e. to the defense of the country against the Palestinian « terrorists »… As we pass through the control, we can’t help noticing the gentleness with which our driver answers the soldier’s rough questions... Phew! Exam passed, we can follow our route. This is the first time we are going along what we suddenly understand to be “the” wall. 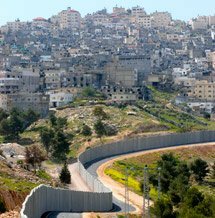 It literally cut the road from Jerusalem to Nablus in two lengthways. It is impossible to know what happens on the other side of it: a locked-up, trapped life, houses, people, a bakery-workshop that used to be thriving, Daoud tells us, an empty greengrocer’s, a deserted school... A few more meters and our mini-bus makes a U-turn then stops on a waste land that is used as a parkplace.We get off, not knowing exactly where we are nor what we are doing there. Tanguy points to the end of the road: checkpoint. This is the place where Marwan should be coming from. When? Nobody can tell. How much time you spend at a checkpoint is one of the many things that are beyond the Palestinias’ control. So we wait. A certain time... It is really not warm, but staying inside the mini-bus doesn’t help. Laurie suggests we used the opportunity to take a picture of the group in front of the wall? Why not. Yet, there is something quite embarrassing… As she shows us the photos she just has just taken, what we suddenly realise is that, in the middle of our smiles to the camera, there is Daoud standing, Daoud who has to live with that “thing”, whose horror and infamy we are not yet completely aware of ... It is also the first time we feel what a darling soul Daoud is, what a deeply gentle and patient man, while we behave like stupid tourists. Here comes our guide finally. Marwan is out of breath. He has been running from the checkpoint. He is sorry we have had to wait so long for him. It is not for want of starting early though, he says with a large smile… Here is another great guy, we think to ourselves, or he is being philosophical. No doubt all the Palestinians have had to become so? The fact is there is no aggressiveness in Marwan’s voice: that’s the way things are, that’s it... So here is the whole team: the tour of the settlements can begin. Marwan and Daoud take the microphone in turn to give us information about the different places and buildings we can see through the rain-dripped windows of the bus. They name the different settlements as we pass along them. All of them are still expanding, they tell us, backing onto the Palestinian districts and forming a real belt all around Jerusalem. It is hard work for us to imagine that the Israelis have developed such a strategy which, we must admit, is nothing less than ethnic cleansing... How will the Israelis act in orderr to achieve their aims? Another short stop (the weather is so cold! 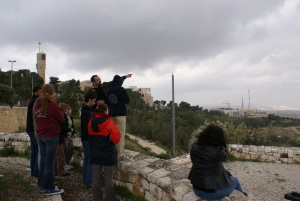 Rain and wind all the time) on a site from which we have an open view on the south and the east of the old city. 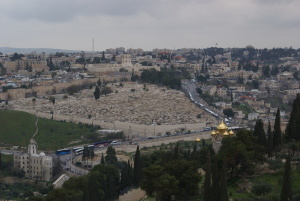 We get off the bus on the top of Mount of Olives, from where we have another great viewpoint on the old city. Marwan is leaving us now. We thank him and whern he answers “you are welcome”, we know he means it. 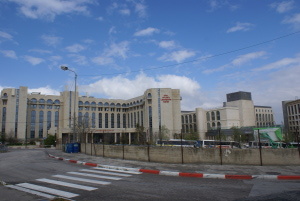 Before we enter the old town again, we go and have a bite with Daoud in a snack-bar situated next to the bus-station in front of the Jerusalem Hotel. A well-known address for the 2009 group: Tanguy and Anne-Claire are happy to meet the boss again and order shawarmas (spicy or not), falafels (with or without vegetable) and... French fries for everybody. Mint-tea in conclusion: we’ll come back! We now go towards Damascus Gate where we meet two young Palestinians of about our age whom Daoud contacted for us. Together with them, we worm our way through the crowd of the souk up to a tea-room where we can sit and have a cosy conversation. Tea, semonila pudding, honey biscuits, almond and pistachio cakes: we loosen up and enter Amer and Razi’s world. They tell us about their studies. Razi explains that he is studying Economics at the Hebrew University (in order words, in Hebrew!). Some of us now go back to the youth hostel to refresh while Caroline, Sébastien, Marie-Gaëlle, Margot and Anne-Claire follow Daoud in the souks. Sébastien would like to buy a narghileh (or chicha). Daoud is going to provide him with silver foil and coal: tonight they will all have a nice smoke together on one of the terraces of the youth hostel, weather permits. But before that, let’s have a great"Jerusalem Mezze" in the Lebanese restaurant Amigo Emil, another well-known address for the 2009 Taayoush group. We try (and enjoy!) a thousand and one delicious things, all served in tiny rectangular porcelain dishes. Natalia doesn’t venture too far and has some pasta. Too bad. Then, Laurie, Natalia and Anne-claire decide to go and have a good night’s sleep at the hostel while the most courageous ones of the gang decide to have a late-night walk on the remparts of the old town. Mamilla road used to strech at the feet of Jaffa Gate, Daoud tells us. 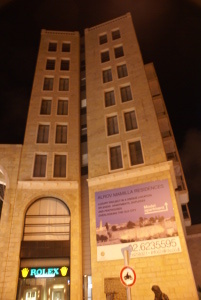 Today it has been turned into a long mall and is the seat of an Israeli shopping centre (Mamilla Center): a very modern-looking place, with a sweet music in the background, hip terraces and all possible American brands. 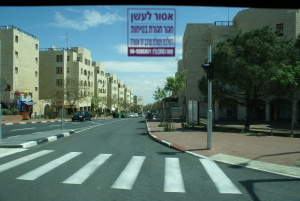 Daoud tells us that this pedestrian street was built right in the middle of the 1949 armistice "no man’s land", on a plot of land that overlaps the well-known green line. This place used to be a mixed district with an entire series of ancient houses whose façades were all dismantled by the municipality of Jerusalem then built up again to shelter the shops of this ultra-chic shopping centre. Any trace of the former houses has been wiped out and the impression is that these shops have been there for a long time... 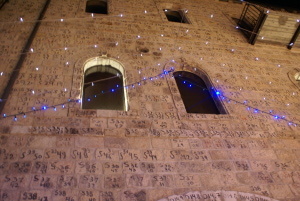 Except that on the stones of many of the façades, you can still see numbers. Numbers which served for the rebuilding of the walls! 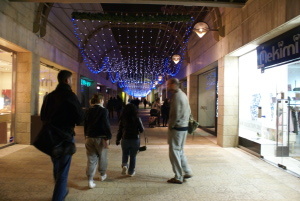 As you leave the shopping-centre, you come out into West-Jerusalem, the Israeli part of the town. At the beginning of Jaffa Street, which is the heart of a project aiming at bringing new dynamism to the surroundings of the old city, we go past a former Muslim cemetery which is going to be redeveloped into a Peace Museum… Ouch… On the other side of the street, huge houses are under restoration work: Israelis want to make their house look oriental (façadisme again), but these new buildings are quite high and consequently quite far from the little houses in the Palestinian way. On this subject, watch the film 9 Star Hotel by Ido Haar, about the life of a group of young Palestinians working illegally as building workers in the Israeli city of Modi’in. See other photos of Shu’fat. 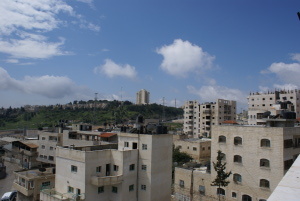 See, for example, the very interesting article "Jérusalem en 2020 sous l’oeil des urbanistes", which was written by the French geographer Irène Salenson. 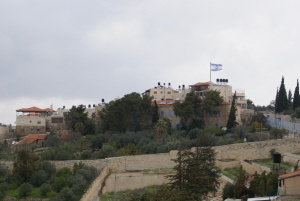 See more photos of East-Jerusalem. We got confirmation about this tourist and trade development plan during our meeting with Mary from the Alternative Information Center, see Thursday, April 14. 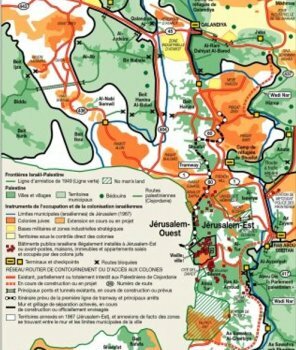 In this respect, it is interesting to have a look at the walk "Jerusalem, from ancient times to future times"balade "Jérusalem, des temps anciens aux temps futurs", which the Office of Tourism in Jerusalem suggests.